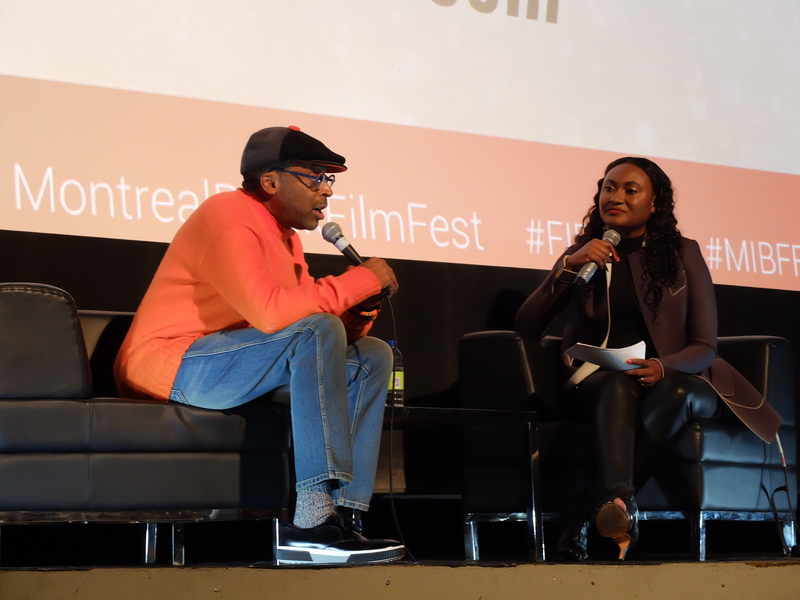 Legendary director Spike Lee talked filmmaking, racism in America and “Agent Orange” at the Cinéma Impérial on Sept. 26 as part of the 14th edition of the Montreal International Black Film Festival (MIBFF). Moderated by MIBFF founder Fabienne Colas, “An Intimate Evening with Spike Lee” was two hours of valuable advice from the star whose latest film, BlacKkKlansman, won the Grand Prix at the 2018 Cannes Film Festival. The crowd erupted with knowing laughter. Lee looked out over the audience. Lee, who teaches film classes at New York University, asked the crowd to raise their hands if they’d seen any of the movies he asks his students to watch. He made his way through the list and then repeated the activity, this time naming the five Spike Lee movies he thinks are most important to see in terms of the messages they convey. Lee said he was impressed by the amount of people who’d seen some of his lesser-known projects. He occasionally yelled, “Don’t lie!” when he suspected the audience might be trying to impress him. Was it so hard to believe that a theatre full of Spike Lee fans had actually seen most of his movies? Colas commended Lee’s consistent activism through his films and documentaries—citing Do the Right Thing and 4 Little Girls as examples—and sought his opinion on the firing of American football quarterback Colin Kaepernick. “Number one, the NFL is guilty of collusion,” Lee said, prompting what was easily the loudest audience reaction of the night. “In no way, shape or form was the act of kneeling about disrespecting the military and the flag. Americans can be stupid sometimes, and they took that, hook, line and sinker. That was about bringing light to how black people are treated in the United States of America,” he said, adding that the United States was built by black people after the land was stolen from Native Americans. BlacKkKlansman is currently screening at select theatres in Montreal.